These delicious rolls are a healthy, and easy to prepare snack for any time of the day. Treat yourself. Wash and cook the quinoa as per packet instructions. Trim the aubergines and slice lengthways into 4mm thick slices. Place in a baking dish and Spray with Fry Light spray, sprinkle with salt and cumin seeds. 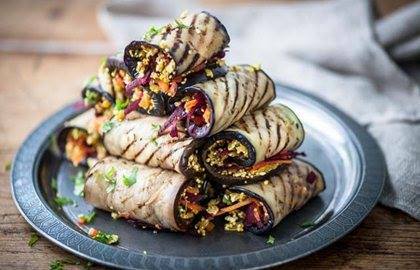 Grill the aubergines in the oven until golden. For the quinoa filling, place a non-stick pan over a medium heat and add Fry Light Spray. Once hot, add the onion and sauté until a light golden brown colour. Add the ginger & garlic paste, turmeric, salt, and chili powder, then sauté for a further 2 minutes. Add the cooked quinoa and cook for further 5-7 minutes, then add the ricotta and remove from the heat. Finish with garam masala powder and chopped coriander. Add the grated vegetables and mix well. Lay out the aubergine slices on a chopping board. Spread a generous layer of the filling on top of each aubergine slice. Roll up each slice to enclose the filling. Who said kebabs have to be unhealthy? These honey chicken kebabs will make you the belle of the ball. These marrow fritters have approximately 400 calories each and can be served as a main meal, as well as eaten at any time of the day. Eat healthy in under 30 minutes with this simple recipe for poached egg with asparagus salad. This versatile salad can be served at breakfast, or as a sweet snack during the day. This salad contains approx. 300 calories and can be served as a side dish or starter to another meal. The best part is it can be eaten at any time of the day. A healthy twist to an Italian classic. This mélange of flavours will simply blow you away. A delicate addition to any dish. This Chickpea roasted vegetables accompany and compliment any meal. This delicious French frittata will keep you full and help keep your cravings at bay throughout the day. A classical Maltese lunch snack, this ftira is healthy, hearty, and, best of all, is a delicious snack that fits into your diet plan.